• The higher the karat content (14kt, 18kt, and 24kt), the deeper the color will buy. A piece of jewelry created in 14kt rose gold will appear lighter or less rich in color than a piece of jewelry created in 18kt rose gold. Also, the higher the karat, then the longer the color will last. Every day wear-and-tear will show on almost any piece of jewelry. • When it comes to rose gold, subtle shades are trending as popular these days. Bright pink is not as popular as a more muted blush-like tone. • If you are looking for a rose gold piece of jewelry featuring gemstones, champagne diamonds and brown diamonds appear stunning. Morganite is also a gemstone that looks fantastic with rose gold (they are available in pastel shades), and the combination of morganite and white diamonds is especially appealing. • You care for a piece of rose gold jewelry in the same manner as any piece of gold jewelry. A soft cloth, warm water and a mild detergent is all you need to keep your rose gold jewelry clean. Every so often, you can bring your design to your local jeweler to polish out any scratches. All jewelry will show signs of every day wearing. Wedding rings and engagement rings in particular come in contact with a lot of different surfaces. • Men can wear rose gold as well! Rose gold wedding rings are becoming more and more popular for men, whether the design is all one color or mixed with a white metal. Novell has recently just designed over two dozen rose gold rings for men because vendors have been noticing the demand. Due to rising metal markets, the merchandise has been created with specific lower price-points in mind. So if you are in the market for a great rose gold ring – keep on the look-out! 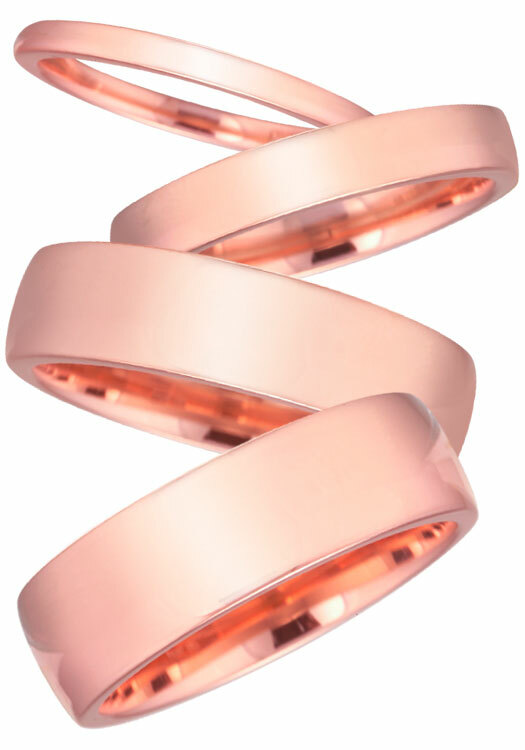 Most Novell wedding bands can be specially made in rose gold. Contact the Novell retailer in your area for pricing and more information. Engraved yellow gold wedding band with white gold twists. Yellow gold is always in fashion, and has historic significance. The MAX1707-7GCT is an 14kt gold wedding band that is 7mm wide. The white gold twists add a little two-tone variation. Novell can customize our wedding band and wedding ring designs to your specifications, so that your wedding band and wedding ring will be one of a kind. Exactly the way you want it. In different metals (platinum, palladium or gold), different widths, finishes and much more. Customization sets Novell apart from all the rest. Engraved white gold wedding band with milgrain. Here’s an engraved wedding band that has milgrain and a satin finish across the decoration. The MAX3092-8GCEW is an 18kt white gold hand engraved wedding band that is 8mm wide. Novell can customize our wedding band and wedding ring designs to your specifications, so that your wedding band and wedding ring will be one of a kind. Exactly the way you want it. In different metals (platinum, palladium or gold), different widths, finishes and much more. Customization sets Novell apart from all the rest. Unique white gold wedding band with raised and textured center. The center of this wedding band not only has texture, but its raised design can definitely be regarded as fairly unusual. The MAX3097-7GCEW is an 18kt white gold wedding band that is 7mm wide. The middle also has both a sandblasted and frosted finish. Novell can customize our wedding band and wedding ring designs to your specifications, so that your wedding band and wedding ring will be one of a kind. Exactly the way you want it. In different metals (platinum, palladium or gold), different widths, finishes and much more. Customization sets Novell apart from all the rest. Did you know that white gold isn’t naturally white? 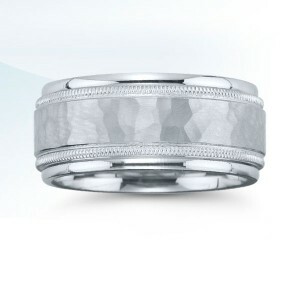 Ask about having this wedding band created in platinum or palladium. White gold wedding band with unique hammered center. The hammered center of this white gold wedding band is both raised and textured, and it’s not something that you would see every day. The MAX3098-7GCEW is an 18kt white gold hammered wedding band that is 7mm wide. Novell can customize our wedding band and wedding ring designs to your specifications, so that your wedding band and wedding ring will be one of a kind. Exactly the way you want it. In different metals (platinum, palladium or gold), different widths, finishes and much more. Customization sets Novell apart from all the rest. Unique white gold wedding band – you don’t see a wedding band like this every day. Big and bold definitely can definitely make a fashion statement. Big watches and big jewelry in general both make grand statements, and a wedding band can as well. The MAX3505-9GW is a 14kt white gold wedding band that is 9mm wide. Novell can customize our wedding band and wedding ring designs to your specifications, so that your wedding band and wedding ring will be one of a kind. Exactly the way you want it. In different metals (platinum, palladium or gold), different widths, finishes and much more. Customization sets Novell apart from all the rest. Hammered wedding band? Did you say that you wanted a hammered finish on your wedding band? The N03512 is a 14kt gold wedding band that is 10mm wide and also has milgrain to go along with its frosted hammered finish. Novell can customize our designs to your specifications, so that your ring will be one of a kind. Exactly the way you want it. In different metals (platinum, palladium or gold), different widths, finishes and much more. Customization sets Novell apart from all the rest. Wide white gold wedding band with bright edges. Here’s a wedding band for the guy that likes a nice wide design. The N03514 is a 14kt gold wedding band that is 10mm wide. Novell can customize our designs to your specifications, so that your ring will be one of a kind. Exactly the way you want it. In different metals (platinum, palladium or gold), different widths, finishes and much more. Customization sets Novell apart from all the rest. White gold wedding band with unique carbon tooled design. Who says that a wedding band has to be ordinary? The center of this wedding band features a great design created by a unique carbon tool process. Featuring a high polished center groove, N01917 is also 6mm wide. Novell can customize our designs to your specifications, so that your wedding ring will be one of a kind. Exactly the way you want it. In different metals (platinum, palladium or gold), different widths, finishes and much more. Customization sets Novell apart from all the rest. White gold wedding band with milgrain and frosted finish. Milgrain is another subtle decoration for wedding bands that adds a little some extra without making the design too much. The NS1013-6GCEW is an 18kt white gold wedding band that is 6mm wide, has bright edges with a frosted finish in the middle. Novell can customize our wedding band and wedding ring designs to your specifications, so that your wedding band and wedding ring will be one of a kind. Exactly the way you want it. In different metals (platinum, palladium or gold), different widths, finishes and much more. Customization sets Novell apart from all the rest. Yellow gold wedding band with textured middle. Here’s a yellow gold wedding band with a unique textured center and bright edges. The NS1025-6GCEY is an 18kt gold wedding band that is 6mm wide. Novell can customize our wedding band and wedding ring designs to your specifications, so that your wedding band and wedding ring will be one of a kind. Exactly the way you want it. In different metals (platinum, palladium or gold), different widths, finishes and much more. Customization sets Novell apart from all the rest. Yellow gold wedding band with thin bright grooves. Yellow gold makes a great fashion statement and almost never goes out of style. The NS1027-6GCEW is an 18kt yellow gold wedding band that is 6mm wide. The thin bright grooves wrap all the way around this wedding band, and its frosted finish ads a nice element as well. Novell can customize our wedding band and wedding ring designs to your specifications, so that your wedding band and wedding ring will be one of a kind. Exactly the way you want it. In different metals (platinum, palladium or gold), different widths, finishes and much more. Customization sets Novell apart from all the rest. Hammered wedding band made in yellow gold. Many hammered wedding bands are usually made in white gold, platinum or palladium. This hammered wedding band look great in yellow gold. The NS1029-7GCEY is an 18kt gold hammered wedding band that is 7mm wide. Novell can customize our wedding band and wedding ring designs to your specifications, so that your wedding band and wedding ring will be one of a kind. Exactly the way you want it. In different metals (platinum, palladium or gold), different widths, finishes and much more. Customization sets Novell apart from all the rest. Hammered white gold wedding band with wide center. Hammered wedding bands are becoming more and more popular, and this style has a wide hammered center, bright edges and a frosted finish on the hammered middle. The NS1035-7GCEW is an 18kt gold wedding band that is 7mm wide. Novell can customize our wedding band and wedding ring designs to your specifications, so that your wedding band and wedding ring will be one of a kind. Exactly the way you want it. In different metals (platinum, palladium or gold), different widths, finishes and much more. Customization sets Novell apart from all the rest. White gold wedding band with raised sandblasted center. A raised center and a little texture can really set a wedding band apart from all others. This design has bright edges and a unique sandblasted center. NS1066-7GCEW is an 18kt gold wedding band that is 7mm wide. Novell can customize our wedding band and wedding ring designs to your specifications, so that your wedding band and wedding ring will be one of a kind. Exactly the way you want it. In different metals (platinum, palladium or gold), different widths, finishes and much more. Customization sets Novell apart from all the rest. White gold wedding band with single center groove. Sometimes a little simple decoration is all you need. The NS1072-6GCEW is an 18kt gold wedding band that is 6mm wide, has a center groove and a frosted finish. Novell can customize our wedding band and wedding ring designs to your specifications, so that your wedding band and wedding ring will be one of a kind. Exactly the way you want it. In different metals (platinum, palladium or gold), different widths, finishes and much more. Customization sets Novell apart from all the rest. Hammered white gold wedding band with a little color. 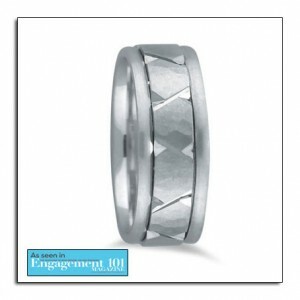 Hammered wedding bands have a rugged look to them, and adding a little color makes a nice variation. 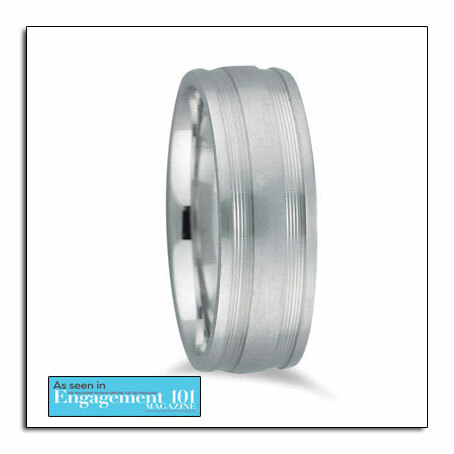 The NS1082-7GCET is an hammered 18kt white gold wedding band that is 7mm wide. Novell can customize our wedding band and wedding ring designs to your specifications, so that your wedding band and wedding ring will be one of a kind. Exactly the way you want it. In different metals (platinum, palladium or gold), different widths, finishes and much more. Customization sets Novell apart from all the rest. Yellow gold wedding bands never goes out of style. Yellow gold has a vast history behind it, and never seems to go out of fashion. The NS1086-7GCEY is an 18kt gold wedding band that is 7mm wide. Novell can customize our wedding band and wedding ring designs to your specifications, so that your wedding band and wedding ring will be one of a kind. Exactly the way you want it. In different metals (platinum, palladium or gold), different widths, finishes and much more. Customization sets Novell apart from all the rest. Wedding band created with classic yellow gold. Here’s one of Novell’s classic yellow gold wedding band designs. The NS909-6GCEY is an 18kt gold wedding band that is 6mm wide. Novell can customize their wedding band and wedding ring designs to your specifications, so that your wedding band and wedding ring will be one of a kind. Exactly the way you want it. In different metals (platinum, palladium or gold), different widths, finishes and much more. Customization sets Novell apart from all the rest. Wide white gold wedding band with hammered finish. Are you looking for a wedding band that’s wider than the ordinary wedding band out there, and has an unusual finish as well? The NS1092-8GCEW is an 18kt gold wedding band that is 8mm wide. Novell can customize their wedding band and wedding ring designs to your specifications, so that your wedding band and wedding ring will be one of a kind. Exactly the way you want it. In different metals (platinum, palladium or gold), different widths, finishes and much more. Customization sets Novell apart from all the rest. Unique grooves on this white gold wedding band. Normally grooves or decoration on wedding bands can be plain or ordinary, but these grooves are pretty unique. Novell’s NS1095-7GCEW is a carved 18kt gold wedding band that is 7mm wide. Novell can customize their wedding band and wedding ring designs to your specifications, so that your wedding band and wedding ring will be one of a kind. Exactly the way you want it. In different metals (platinum, palladium or gold), different widths, finishes and much more. Customization sets Novell apart from all the rest. White gold wedding band with a unique sandblasted finish. Novell’s NS1096-6GCEW is an 18kt gold wedding band that is 6mm wide. The edges are bright and the center has a unique sandblasted finish that you don’t see every day. Novell can customize their wedding band and wedding ring designs to your specifications, so that your wedding band and wedding ring will be one of a kind. Exactly the way you want it. In different metals (platinum, palladium or gold), different widths, finishes and much more. Customization sets Novell apart from all the rest. White gold wedding band with bright edges. White gold is a nice option for your wedding band, and here a classic style with bright edges and a frosted finish in the middle. The NS1098-7GCEW is an 18kt gold wedding band that is 7mm wide. Novell can customize their wedding band and wedding ring designs to your specifications, so that your wedding band and wedding ring will be one of a kind. Exactly the way you want it. In different metals (platinum, palladium or gold), different widths, finishes and much more. Customization sets Novell apart from all the rest. Yellow gold wedding band with bright grooves. This best selling yellow gold wedding band has bright grooves and a brushed finish. The NS907-7GCW is a carved 14kt gold wedding band that is 7mm wide. Novell can customize their wedding band and wedding ring designs to your specifications, so that your wedding band and wedding ring will be one of a kind. Exactly the way you want it. In different metals (platinum, palladium or gold), different widths, finishes and much more. Customization sets Novell apart from all the rest. Wedding bands with rounded edges featured on MarthaStewartWeddings.com. MarthaStewartWeddings.com featured N’Oval wedding bands by Novell. N’Oval wedding bands are Novell’s answer to the plain band, but with a twist. All edges are rounded on each side for a natural and more comfortable fit. New platinum engagement rings and ladies wedding bands. Novell is proud to preview selections from our upcoming bridal line. These featured engagement rings and ladies’ wedding bands are pictured in all platinum, but can also be specially created in palladium or gold as well. And like all Novell wedding band products, all styles in the new bridal collection are Made in America. Individual images with product details will soon be added to Novell’s consumer wedding band website and also to our retailer business-to-business section for 24 hour pricing availability and online ordering. Stay tuned! Coming soon from Novell - new engagement rings and ladies' wedding bands. Max Squared wedding bands featured in The Jewelry Book. 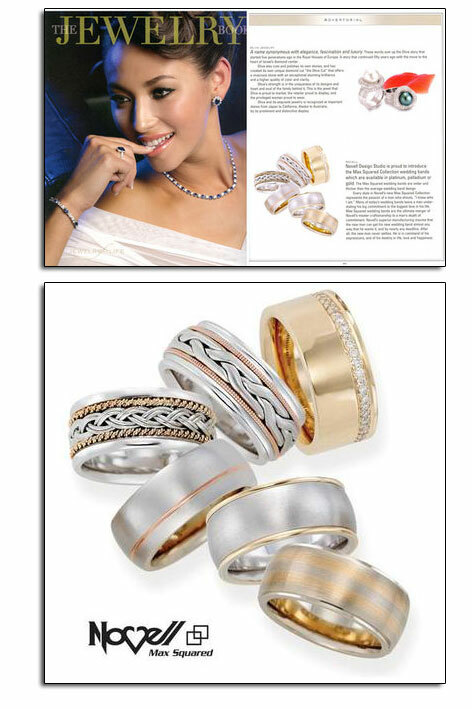 The Winter 2009 issue of The Jewelry Book featured wedding bands from Novell’s Max Squared Collection. Max Squared wedding bands as featured in The Jewelry Book. Novell’s BOLD wedding band for the BIG commitment. Novell Design Studio is proud to offer Max Squared Collection wedding bands – the BOLD ring for the BIG commitment. Available in platinum, palladium or gold, Max Squared rings are wider and thicker than the average wedding ring style. After all – why settle for just an ordinary wedding band when only the very best will do? Please visit www.novelldesignstudio.com/max to download the latest product brochure and to locate an authorized Novell retailer. As seen on Engagement101Mag.com – gold wedding band NS1095-7GCEW. Novell wedding band style NS1095-7GCEW. This wedding band is 7mm wide and comfort fit. It can also be made in platinum, palladium or yellow gold. Please visit www.novelldesignstudio.com to find an authorized Novell wedding band retailer in your area. White gold wedding band as featured on a leading bridal website. This wedding band can be made in platinum, palladium or yellow gold as well. 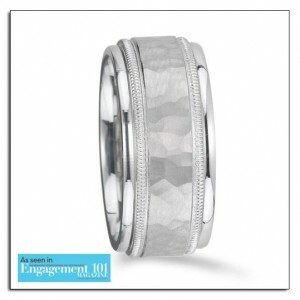 As seen on Engagement101Mag.com – gold wedding band MAX3512-10GW. Novell hammered gold wedding band style MAX3512-10GW. 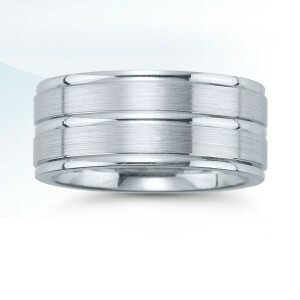 This wedding band is 10mm wide and has a hammered finish. It can also be made in platinum, palladium or gold. Please visit www.novelldesignstudio.com to find an authorized Novell wedding band retailer in your area. White gold wedding band with hammered finish from Novell's Max Squared Collection. As seen on Engagement101Mag.com – gold wedding band MAX3505-9GW. Novell gold wedding band style MAX3505-9GW. Thiswedding band is 9mm wide. It can also be made in platinum, palladium or yellow gold. 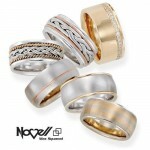 Please visit www.novelldesignstudio.com to find an authorized Novell wedding band retailer in your area. White gold wedding band featured on a leading bridal website - Engagement101Mag.com. This wedding band can also be made in platinum, palladium or yellow gold. As seen on Engagement101Mag.com – gold wedding band MAX3501-9WPK. 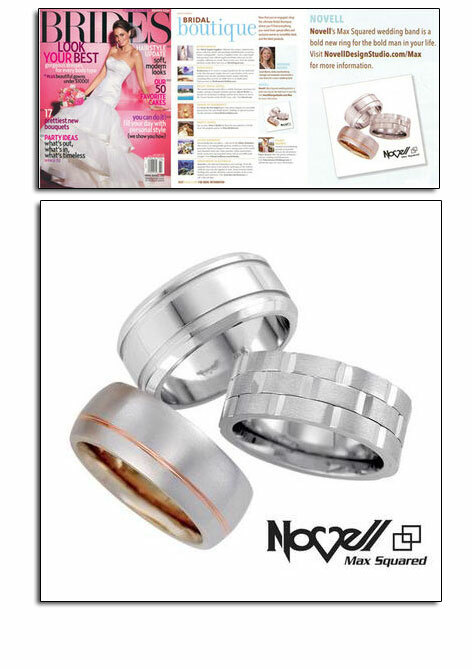 Leading wedding website Engagement101Mag.com featured Novell white gold wedding band style MAX3501-9WPK . This wedding band is 9mm wide with 14kt pink gold accent. It can also be made in platinum, palladium or all yellow gold. 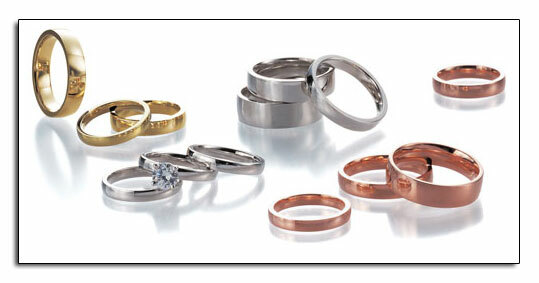 Please visit www.novelldesignstudio.com to find an authorized Novell wedding band retailer in your area. Gold wedding band from Novell's Max Squared Collection. 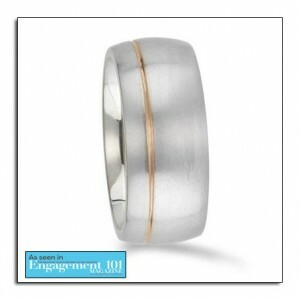 As seen on Engagement101Mag.com – hammered wedding gold MAX3098-7GCEW. Leading wedding website Engagement101Mag.com featured Novell white gold wedding band style MAX3098-7GCEW. 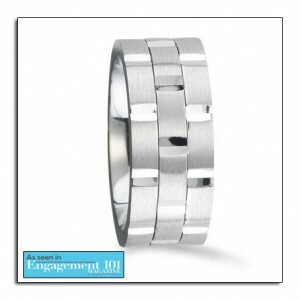 This wedding band is 8mm wide and has a hammered finish. It can also be made in platinum, palladium or yellow gold. 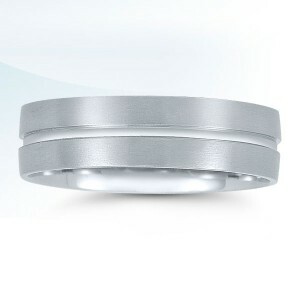 Please visit www.novelldesignstudio.com to find an authorized Novell wedding band retailer in your area. Hammered white gold wedding band as featured on a leading bridal website. Video brochure available for the N’OVAL wedding band. 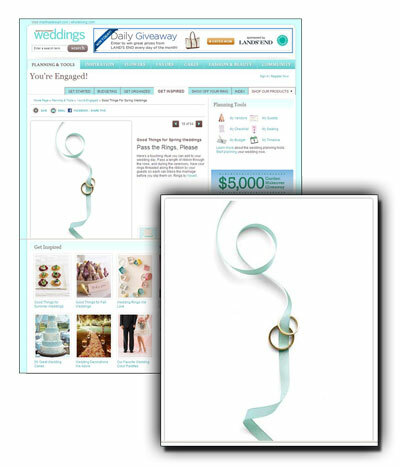 Novell is proud to announce the availability of a new online video brochure for the N’OVAL wedding band product line. The N’OVAL is Novell’s answer to the plain wedding band. But since no piece of jewelry should actually be regarded as “plain,” we have specially created a more comfortable and practical wedding band for every day wearing. A N’OVAL is constructed with more height than the standard plain band, and is curved on all four surfaces, creating a cushion at all points of contact with your hand. It’s the wedding ring with a natural fit. N’OVAL styles are also available in a variety of metals (platinum, palladium or gold), widths, sizes or thickness. All you have to do is ask! This wedding band video can be downloaded and saved to your iPod for viewing. N’OVAL – The no-frills wedding band with a twist! The N’OVAL is Novell’s answer to the plain wedding band. Since no piece of jewelry should actually be regarded as “plain,” Novell has created the everyday wedding band for everyday wearing. A N’OVAL is higher than the standard plain wedding band, and is curved on all four surfaces, creating a cushion at all points of contact with your hand. N’OVAL wedding bands are available in platinum, palladium, gold and now Argentium Sterling Silver. N'oval wedding bands are the "plain" wedding bands with a twist. Max Squared wedding bands in Modern Bride. 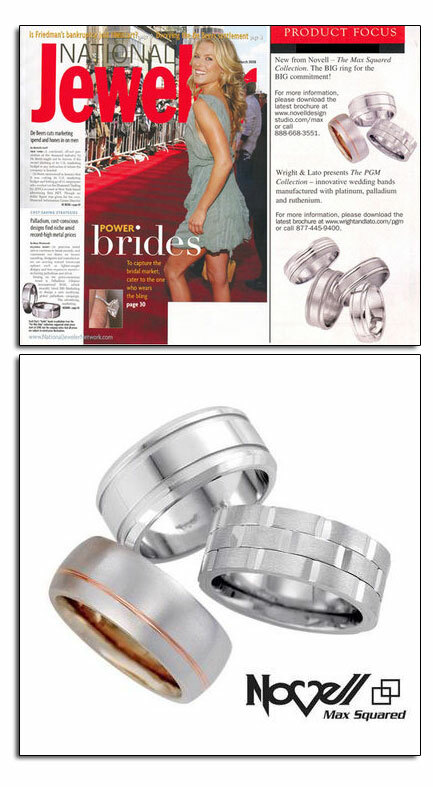 The August/September 2008 edition of Modern Bride magazine featured Max Squared wedding bands MAX3501-9GWPK, MAX3515-10GW and MAX3505-9GW. Download the Modern Bride article. Download the Max Squared Collection brochure. View the video featuring wedding bands from the Max Squared Collection. Max Squared wedding bands as featured in Modern Bride. Max Squared wedding bands – BIG and BOLD. This is the age of the new man. His love for her is bigger and his sense of fashion is bolder, so his expression of commitment should relay a feeling of great depth. Every ring in The Max Squared Collection represents the passion of a man who shouts “I know who I am” from the highest of all mountain tops. Many of today’s mass market wedding bands leave a man understating his BIG commitment to the BIGGEST love in his life. Max Squared wedding bands make that brave statement. They are the ultimate merger of Novell’s master craftsmanship to a man’s depth of commitment. Available in platinum, palladium or gold, Max Squared wedding bands are wider and thicker than the average wedding band style. Novell superior manufacturing insures that the new man can get his new ring almost any way that he wants it, and by nearly any deadline. After all, the new man never settles. He is in command of his expressions, and of his destiny, in life, love and happiness. 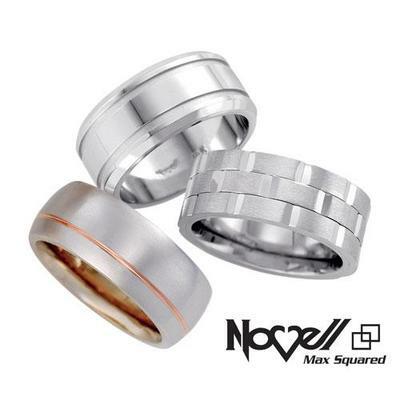 Max Squared wedding bands by Novell. Max Squared wedding bands in Elegant Bride. The Summer 2008 issue of Elegant Bride magazine featured Novell Max Squared wedding band styles MAX3518-10GWPK and MAX3500-10GCY. This placement highlights Novell’s customization capabilities, and encourages consumers to download a catalog. Download the entire Elegant Bride feature. 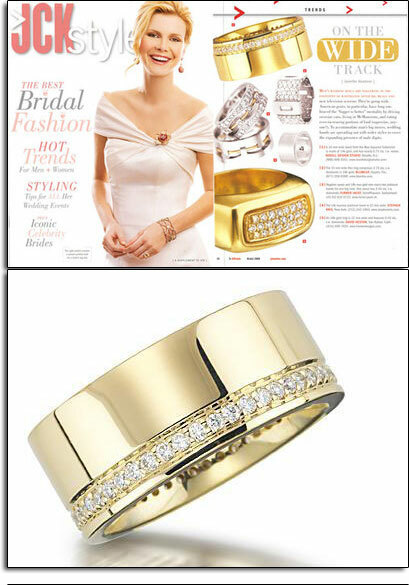 Max Squared wedding bands as featured in Elegant Bride. Max Squared wedding bands in Brides. 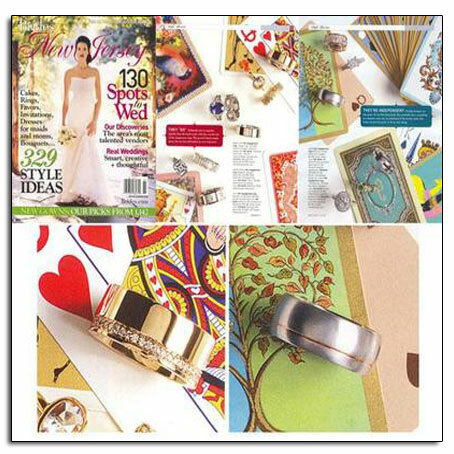 The July/August 2008 issue of Brides magazine featured wedding band styles from Novell’s Max Squared Collection – MAX3513-10GW, MAX3504-10GCW (6 x .10 diamonds) and MAX3517-10GW. Download the Brides magazine feature. View the Max Squared video brochure. Download the Max Squared brochure. Max Squared wedding bands as featured in Brides. Max Squared wedding band featured in JCK Style. The March 2008 edition of JCK Style featured Max Squared wedding band MAX3500-10GCY (48 x .015 diamonds). Download the Max Squared wedding band feature. 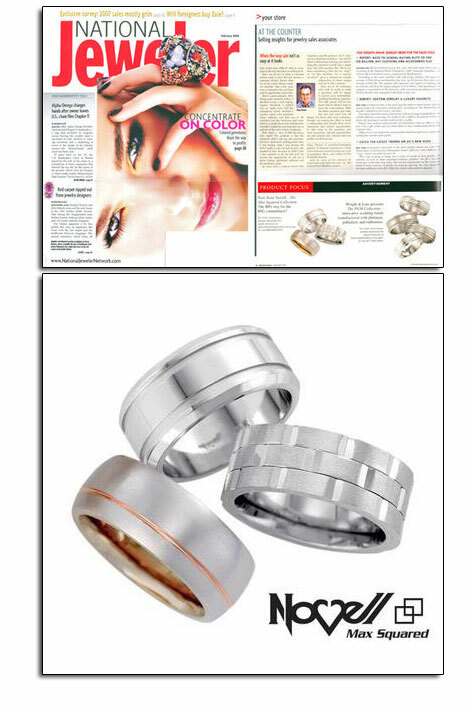 Max Squared wedding bands in National Jeweler. 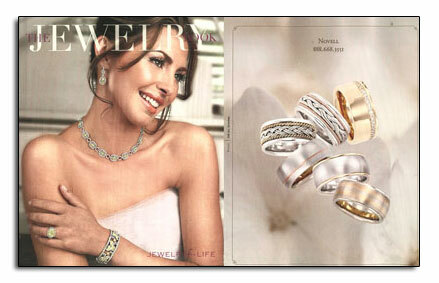 The March 2008 issue of National Jeweler featured Novell’s Max Patrick Collection wedding bands (on page 53). The wedding band styles are as follows (top to bottom) – MAX3515-10GW, MAX3505-9GW, and MAX3501-9GWPK. Rings from the Max Patrick Collection have also recently been seen in Brides (national and regional editions), Modern Jeweler, JCK Luxury and The Knot magazines. Download the National Jeweler Max Squared wedding band feature. 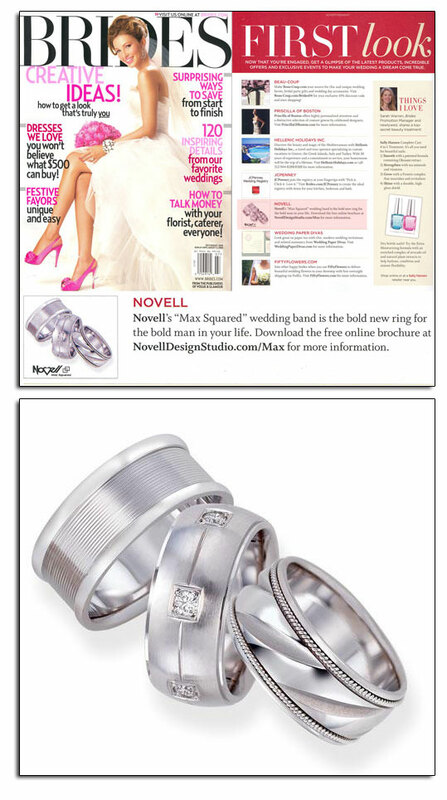 Max Squared wedding bands in National Jeweler. The big and bold wedding band for the bold man. 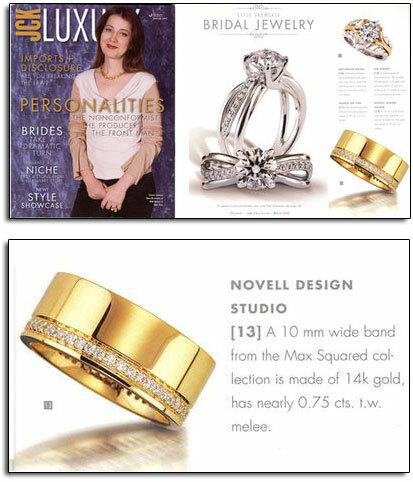 The February 2008 issue of National Jeweler featured Novell’s Max Squared Collection wedding bands (on page 46). The wedding band styles are as follows (top to bottom) – MAX3515-10GW, MAX3505-9GW, and MAX3501-9GWPK. Rings from the Max Squared Collection have also recently been seen in Brides (national and regional editions), Modern Jeweler, JCK Luxury and The Knot magazines. The March/April edition of Brides magazine featured Max Squared wedding bands MAX3501-9GWPK, MAX3515-10GW and MAX3505-9GW. Download the Brides magazine editorial featuring Max Squared wedding bands. Max Squared wedding band in JCK Luxury. The Winter 2008 edition of JCK Luxury featured Max Squared wedding band style MAX3500-10GCY (with 48 x .015 diamonds). Download the JCK Luxury editorial feature. Max Squared wedding band featured in JCK Luxury. Max Squared wedding bands in The Knot bridal magazine. The Spring/Summer 2008 issue of The Knot featured Max Squared Collection wedding bands. Download the Max Squared wedding band brochure. Max Squared wedding bands as featured in The Knot magazine. 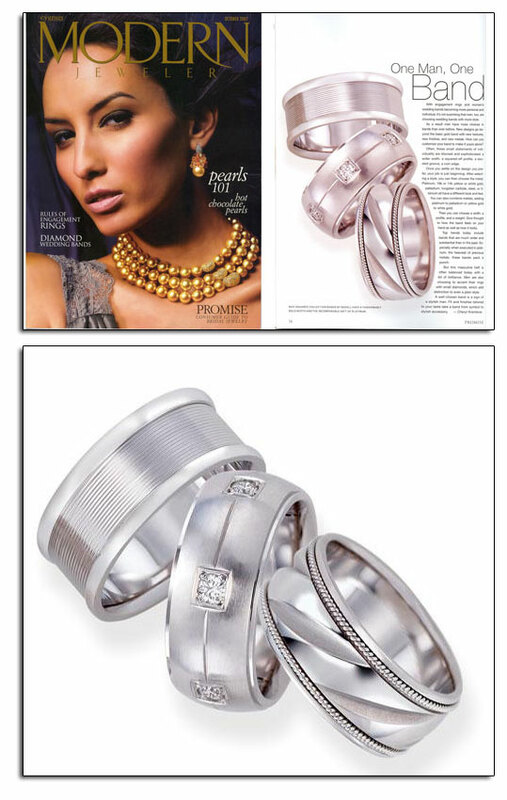 Max Squared wedding bands in Brides magazine regional editions. Regional editions of Brides featured Max Squared Collection wedding band styles MAX3500-10GCY (48 x .015 round diamonds) and MAX3501-9GWPK. Download the Brides magazine editorial featuring Max Squared rings. 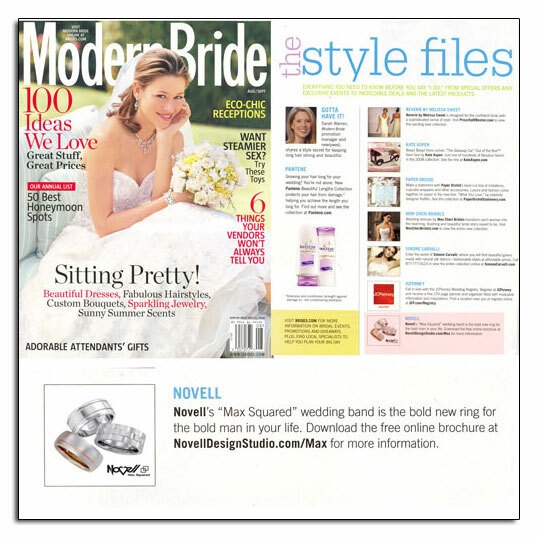 Max Squared wedding bands featured in Brides. Max Squared wedding bands in The Jewelry Book. 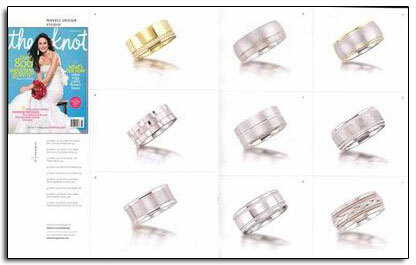 The Fall 2007 issue of The Jewelry Book featured Novell wedding band styles from the Max Squared Collection — (counter clockwise from top right: MAX3500-10GCY, MAX3518-10GWPK, MAX3519-10GT, MAX3501-9WPK, MAX3502-10GT, and MAX3503-9GT). Download The Jewelry Book article. Max Squared wedding bands in Modern Jeweler. The October 2007 issue of Modern Jeweler‘s Promise: A Consumer Guide To Bridal Jewelry featured Max Squared wedding ring styles MAX3513-10GW, MAX3504-10GCW (6 x .10 diamonds) and MAX3517-10GW on page 14. View the latest online version of Modern Jeweler. Max Squared wedding bands as featured in Modern Jeweler. BIG and BOLD wedding bands for the bold man. Free wedding band brochure download for Max Squared wedding bands. The BOLD wedding band for the BOLD new man! Available in platinum, palladium or gold, Max Squared wedding bands are wider and thicker than the average wedding band style. Novell’s superior manufacturing insures that the new man can get his new ring almost any way that he wants it, and by nearly any deadline. After all, the new man never settles. He is in command of his expressions, and of his destiny, in life, love and happiness. Download the free PDF brochure at http://www.novelldesignstudio.com/max/. Big and bold wedding bands by Novell.